Los Angeles airport known as LAX was designed in U shape called a "horseshoe" and got nine passenger terminals. 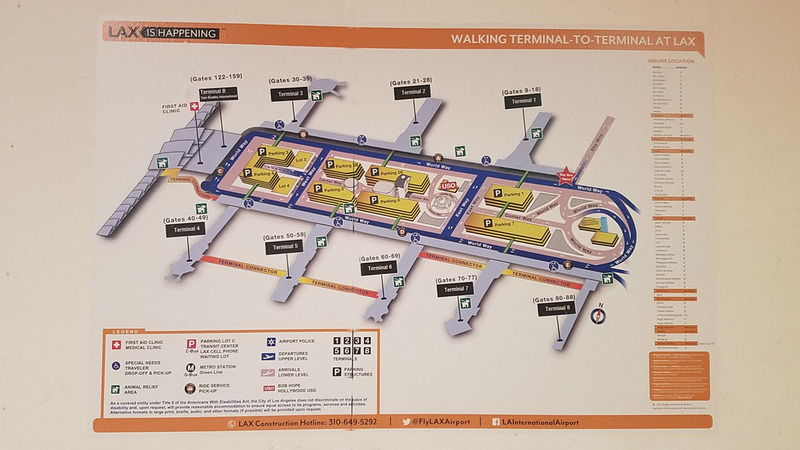 Terminals 5, 6, 7, and 8 are all attached airside via an underground tunnel between Terminals 5 and 6 and above-ground walkways between Terminals 6, 7, and 8.that allow connecting travelers to access other terminals without having to re-clear through security. LAX is undergoing an amazing renovations, so please plan ahead and leave early. In May 2017 Delta (previously used terminal 5) moved the operation to Terminals 2 and 3, and other airlines such as Avianca, Hainan and Qatar moved to different terminals like Tom Bradley International, Terminal 5 and Terminal 6. Before you fly make sure to check out terminal assignments and you know what terminal you will be leaving from. Terminal one has introduced Southwest travelers to many dining and retail destinations and new terminal design with open views of flight operations outdoor. Checked baggage inspection is fully automated, new nursing room and include animal relief station! Terminal two hosts most foreign airlines not using the TBIT along with a couple of domestic airlines: Delta, Aeroméxico, Air Canada, Air China, Air France, Avianca, KLM, Air New Zealand, Alitalia, Hawaiian Airlines, Sun Country Airlines, Virgin Atlantic, Volaris, and WestJet. Former tenants of the terminal include Northwest Airlines, Pan American World Airways, and Taca International Airlines. The new modernized and reconstructed of the passenger and baggage processing facilities in terminal three. Do not forget to check out La Familia and Shake shack restaurant. Tom Bradleywas the first African-American who served 20 years as mayor of Los Angeles, and champion of LAX. The terminal is between Terminals 3 and 4 located at the west end of the passenger terminal area. Tom Bradley International Terminal hosts 27 airlines and handles around 10 million passengers annually. Los Angeles airport (LAX) connects 87 domestic and 69 international destinations in North America, Latin America, Europe, the Middle East, Asia, and Oceania. Its most prominent airlines are United Airlines, American Airlinesand Southwest Airlines. Other airlines with a presence on a lesser scale include Delta Air Lines and Alaska Airlines. It is home for American Airlines, which operates its West Coast hub at the airport, and for its subsidiary commuter carrier, American Eagle Airlines. American is the only tenant at T4, other than daily Qantas departure to Brisbane. Air Canada - Alaska Airlines - Boutique Air - Ethiopian Airlines - Great Lakes Mokulele - Airlines Thomas Cook - Virgin America - Viva Aerobus XL - Airways France. Iconic "Sunset Boulevard"-themed concessions include many dining and retail options is located in terminal six. Terminal 7 & 8 are the home to United Airlines and United Express. The terminal also contains a United Club and International First Class Lounge. 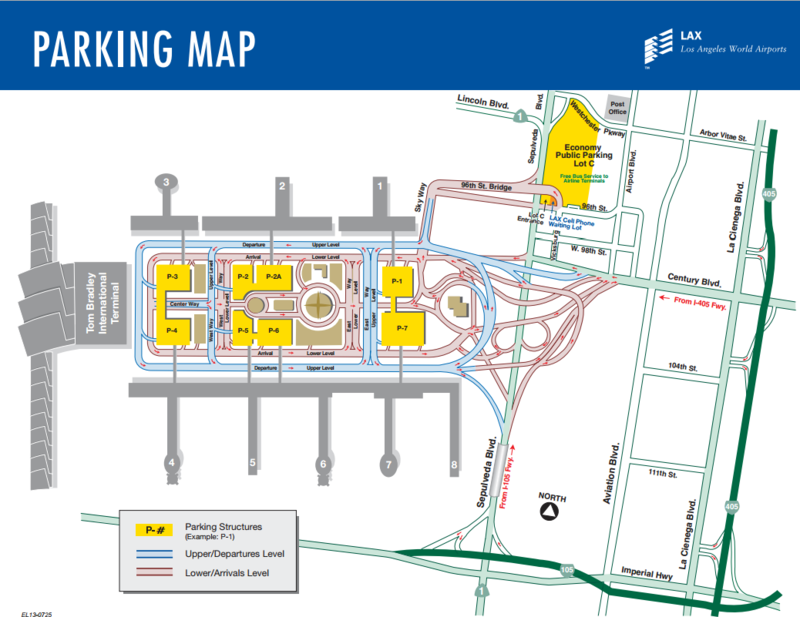 LAX has Parking lot close to each terminal, an Economy Parking lot C, and a Cell Phone Waiting Lot. Terminal Parking is primarily for pick up and drop off, although longer term parking is also available. Conveniently located for the terminals, it is a more expensive longer-term option $30/day.The Economy Parking Lot is a cheaper option for daily and long term parking.